The Primary Well-Water Natural Ceramic Filter by PureEasy is an absolute necessity for well-water users or for anyone with either bacteria issues or filter-clogging issues with their water. 1. Best sediment trap! The Primary Well-Water Natural Ceramic Filter by PureEasy will absolutely not allow sediment to go through it! Are you tired of constantly having to replace your expensive drinking water filters? The Primary Natural Ceramic Well-Water Filter by PureEasy simply won't let the sediment or any other filter-clogging thing through. 2. The Primary Well-Water Filter by PureEasy won't even let bacteria, fungus, algae, and rust through to the filter! The natural ceramic tiny pores will keep them out. 3. The Primary Well-Water Natural Ceramic Filter by PureEasy is washable. If you have a rainstorm, melting snow or for some other reason your water contains a large influx of sediment the worst that can happen is that your water-flow will slow down. The good news is that your filters have not been ruined because the ceramic won't let the sediment through. The better news is that your ceramic filter isn't ruined either! Just remove it and clean it per the instructions and then re-install the ceramic filter. Voila! Good as new! The Primary Well-Water Natural Ceramic Filter is intended for single, point-of-use application and not for a whole-house filter. The materials are completely BPA free and made with food-grade AS and ABS plastics. It can be used alone or as a protective pre-filter to a more expensive filter system or water ionizer. The sticker on the front of the housing is just for display. The Primary Natural Ceramic Well-Water Filter by PureEasy has a neutral, off-white color to go with any decor. 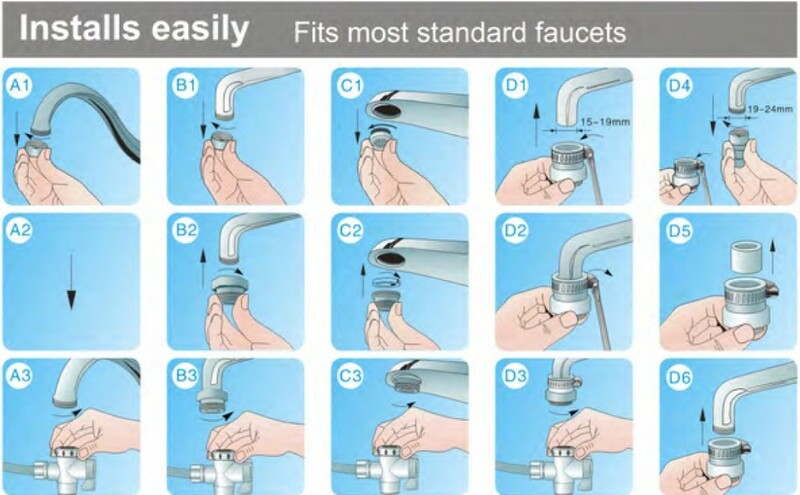 2) The pre-filter set up does not include a filter faucet or spout, but it does come with the proper John Guest Quick Connect fittings that you need to install it prior to your water ionizer or other filter system. A single, easy-change filter contains all 3 stages of the PureEasy 3-stage filter system. The PureEasy countertop filter removes rust, sediment, chlorine, heavy metals, organic pollutants, chemicals, disinfection byproducts, unpleasant taste and odors and inhibits bacterial growth! 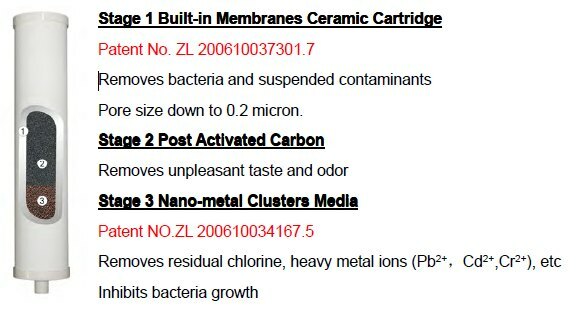 The outer layer of the dual-ceramic catches all of the impurities in the water down to either .01 or .05 microns, depending on which filter you have installed. The default filter for this system is the CM01 filter. 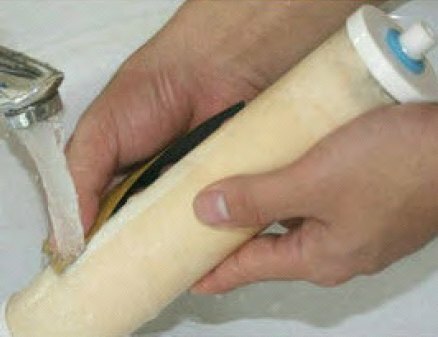 If the filter slows down over time, then the sediment collected on the ceramic filter can be lightly scrubbed off, allowing you to extend the life of the filter by at least twice that of a plastic-cased or fiber-cased filter of its kind. The filter media is designed to last an average family over a year! The ceramic is designed to last even longer! You can clean the ceramic to renew it if at any time the filter's flow-rate slows down. The PureEasy Filter System Is Easy to Install! It can be used independently or as a prefilter to your water ionizer. This demo video gives you a good overall intro to the natural ceramic filter systems by PureEasy. We offer this filter system either as a stand-alone system or a customized pre-filter system. If you would rather customize it yourself, watch this video which demonstrates how to do that.